Do you enjoy being outdoors? Like botany or gardening? Enjoy meeting people and sharing information about Acadia National Park? If so, consider becoming a docent for the Wild Gardens of Acadia. Wild Gardens Docents enable visitors to take greater advantage of the educational opportunities available at the Gardens. What does it mean to be a docent? During summer and fall months, docents greet visitors at the Wild Gardens, including travelers from the Island Explorer buses and commercial bus tours. They welcome visitors, orient them to the gardens and point out any interesting features, direct children to available activities, and answer questions. Training is provided, and you can volunteer at times that meet your own schedule. 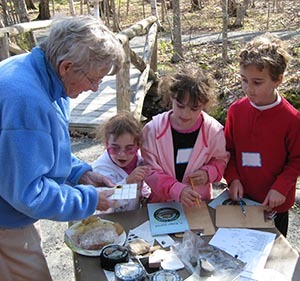 To learn more about the Wild Gardens of Acadia volunteer docents, contact Stephanie Clemet at 207-288-3340 or use our volunteer information request form.